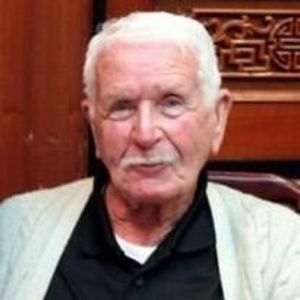 Richard Grimes passed on October 30 of natural causes in Sunrise Living Center in Monterey, California at the age of 95. Richard, a graduate of Michigan State University and World War II veteran, taught science for over 20 years the majority at El Sausal middle school in Salinas. He enjoyed golf, gardening, travel and playing his guitar, often times at American Legion dances. Richard was born on October 10, 1922 in Hartford City, Indiana. He and his 8 siblings endured the depression living with various relatives, sometimes miles apart. Although there was rarely much to choose from at meal time, Dad always recalled with a smile that he never went hungry. After the military and college, Richard moved west finding employment briefly in the petroleum industry in central California before beginning his teaching career. Dad spent many summers with his two boys traveling the backroads of the United States in his self-designed Ford Econoline camper van with no particular destination other than avoidance of the main highways. Richard was preceded in his passing by all of his siblings as well as longtime companion Florence Green. He is survived by his current love of 13 years, Suzie Moore and her family as well as sons David and Glenn, step children Deborah Swanson, Randy and Renee Green, and grandsons Noah and Aaron.